Heat 1 tablespoon of oil in Presto® Electric Skillet at 375°. Add half of beef cubes; brown on all sides. Transfer beef to a clean plate. Add remaining beef cubes; brown on all sides. Transfer to plate. Reduce temperature to 300°. Add remaining 1 tablespoon oil. Add onion and celery; sauté until just soft, about 2 minutes. Add garlic, paprika, and allspice; sauté for 1 minute. Return beef and any juice to skillet; combine with tomato juice, broth, Worcestershire sauce, sugar, salt and pepper. Bring liquid to a boil. Reduce heat to simmer, between Warm and 200°. Cook for 30 minutes. 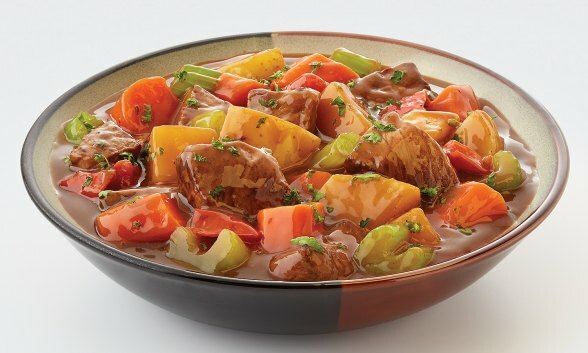 Add potatoes and carrots and continue cooking for 1 hour. Stir in lemon juice and parsley. Adjust seasoning to taste.